2014 HwaCheon VT-650 L MC CNC Live Turret High Performance Vertical Turning Center s/n M100362H4G B w/ Fanuc Series 0i-TD Controls, Tool Presetter, 12-Station Live Turret, 2000 RPM Spindle, Hand Wheel, Simultaneous Controllable 3-Axis Expansion, 0.001 Degrees “C”-Axis Index Angle, Rigid Tapping, 31.4” Max Turning Diameter, 35.37” Swing Over Bed, 29.47” Max Turning Length, 18” 3-Jaw Power Chuck, 3.9” Diameter Thru Spindle, Axial and Radial Live Tooling @ 3000 RPM, Upgraded hip Conveyor, High Flow Coolant System, 453 Metered Hours. 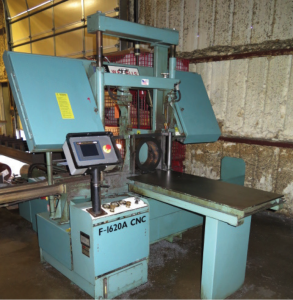 Center s/nM905362H4G A w/Fanuc Series 0i-TD Controls, Tool Presetter, 12-Station Live Turret, 2000 RPM Spindle, Hand Wheel, Simultaneous Controllable 3-Axis Expansion, 0.001 Degrees “C”-Axis Index Angle, Rigid Tapping, 31.4” Max Turning Diameter, 35.37” Swing Over Bed, 29.47” Max Turning Length, 18” 3-Jaw Power Chuck, 3.9” Diameter Thru Spindle, Axial and Radial Live Tooling @ 3000 RPM, Upgraded Chip Conveyor, High Flow Coolant System, 175 Metered Hours. Controls, 12-Station Turret, Hydraulic Tailstock, 2000 RPM, 4.5” Diameter Thru Spindle Bore, 37” Swing Over Bed, 24.4” Max Turning Diameter, 32.7” Max Turning Length, 18” 3-Jaw Power Chuck, Chip Conveyor, Coolant, 331 Metered Hours. 2012 Mori Seiki Dura Vertical 5100 CNC Vertical Machining Center s/n DV005120113 w/ Mori Seiki FOiMD Controls, 30-Station Side Mounted ATC, CAT-40 Taper Spindle, 12,000 RPM Spindle, Thru Spindle Coolant, DDRTI/F, Chip Augers, Chip Conveyor, Chip Blaster High Pressure / High Volume Coolant System, 23 ½” x 53” Table. 2005 Haas SL-20T CNC Turning Center s/n 70191 w/ Haas Controls, “A” Package, Tool Presetter, 10-Station Turret, 20Hp Vector Dual Drive, 4000 RPM Baldor Spindle Motor, Tailstock, Haas VOP-B, Rigid Tapping, M19 Spindle Orientation P & R Codes, Quick Code, 10mm Pitch Ball Screws, 10” 3-Jaw Power Chuck, Haas Coolant Filtration System, Chip Conveyor, Coolant. 2008 Haas SL-20 CNC Turning Center s/n 3080844 w/ Haas Controls, “A” Package, Tool Presetter, 10-Station Turret, 20Hp Vector Dual Drive, 4000 RPM Baldor Spindle Motor, Rigid Tapping, USB Port, 10” 3-Jaw Power Chuck, Chip Auger, Haas Coolant Filtration System, Coolant. Coolant Filtration System, Chip Conveyor, Coolant.